Understand the why, when and how, first. Research from one university in the US suggests the use of inoculants in soybeans to be a sure-fire method of boosting yields and increasing profits. Following more than 10 years of field tests, Dr. Jim Beuerlein of Ohio State University concludes growers can raise yields an average of 1.9bu/ac through the use of inoculants. He also contends such an increase will produce ‘a profit of about 300 percent when beans are worth US$6.00 per bushel and the inoculation material costs $3.00 per acre’. Like a form of mimicry however, it follows a pattern where some growers inoculate and others follow their lead. If fewer growers are inoculating, then less seems to be done in the region. Bohner estimates that 35 percent of growers in Ontario inoculate their soybeans. From a biological and symbiotic perspective, inoculation is important for soybean production. To produce a 50bu/ac crop, soybeans will remove 210lb/ac of nitrogen. In most Ontario trials, about two thirds of that is soil N and one third is atmospheric nitrogen fixed symbiotically by rhizobia in the soybean nodules. The symbiosis occurs between the soybean plant and the bacterial strain Bradyrhizobium japonicum. The bacteria help form the nodules which convert N2 from the air to more readily usable ammonium (NH4+). 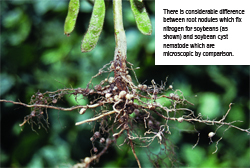 The soybean plant can convert the nitrogen it needs to grow while the rhizobia receive carbohydrates, minerals and a protected environment in which to live. To Dr. Dave Hume, inoculating new soybean ground is a given. Yet he acknowledges all of the reasons why growers might not favour inoculating when soybeans have been grown previously, including the pay back, the apparent hassle of growers having to inoculate their own soybean seed and initially, the lack of visible results. “When those beans come up, they’re not going to have a whole lot more nodules on them, they’re not necessarily going to have a height difference or a colour difference,” says Hume, professor emeritus at the University of Guelph and a consultant with Agri-Trend Agrology.